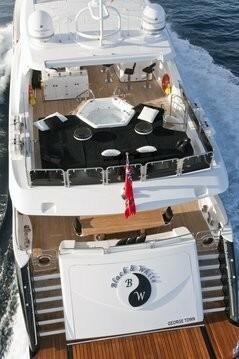 Luxury motor yacht BLACK AND WHITE is a 2010 Sunseeker measuring 34,00m (111' 6"). 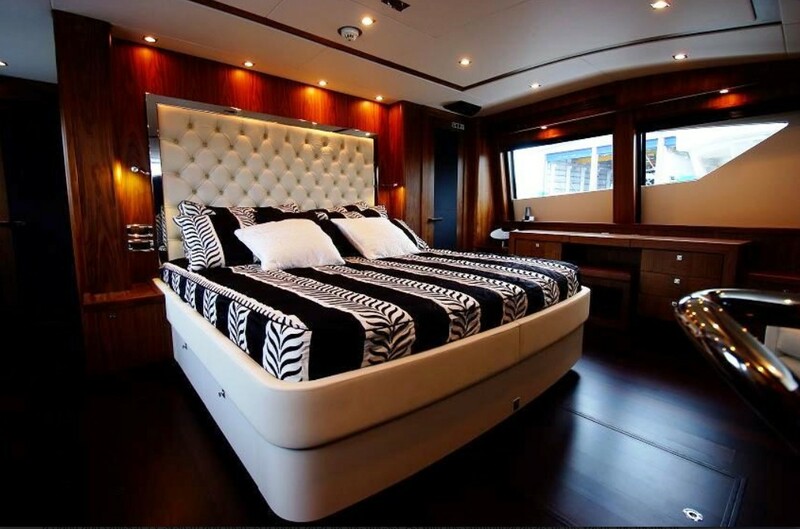 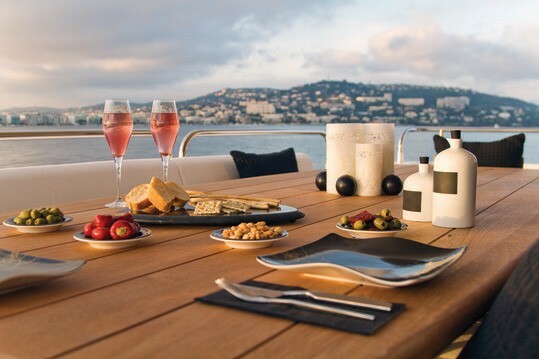 The yacht is incredibly modern and stylish and carries a black and white theme throughout as suggested by her name. 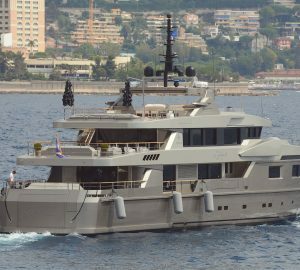 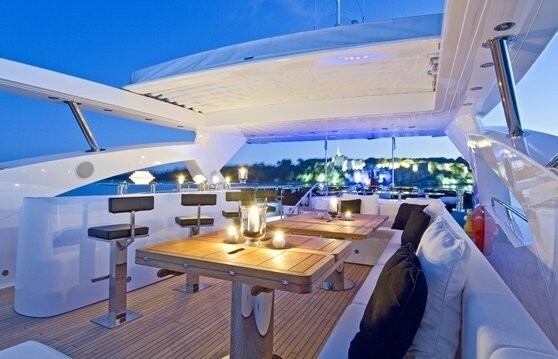 She can accommodate up to 10 charter guests. 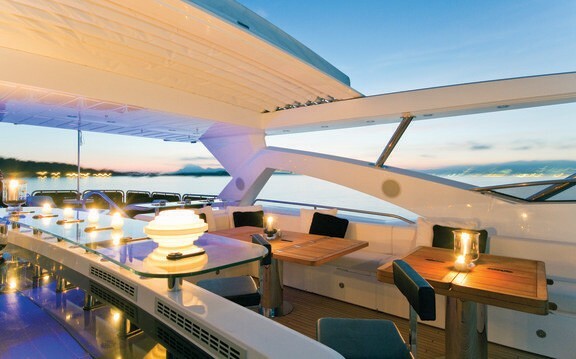 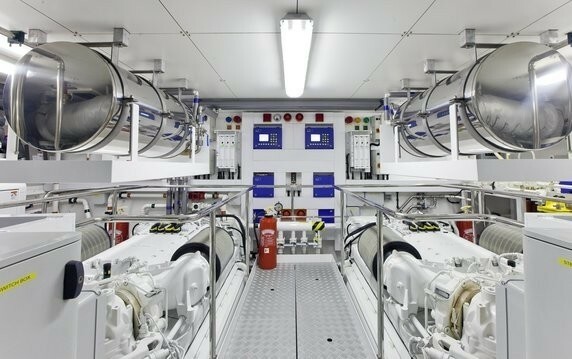 Walking onboard this yacht is like walking into a floating piece of art. 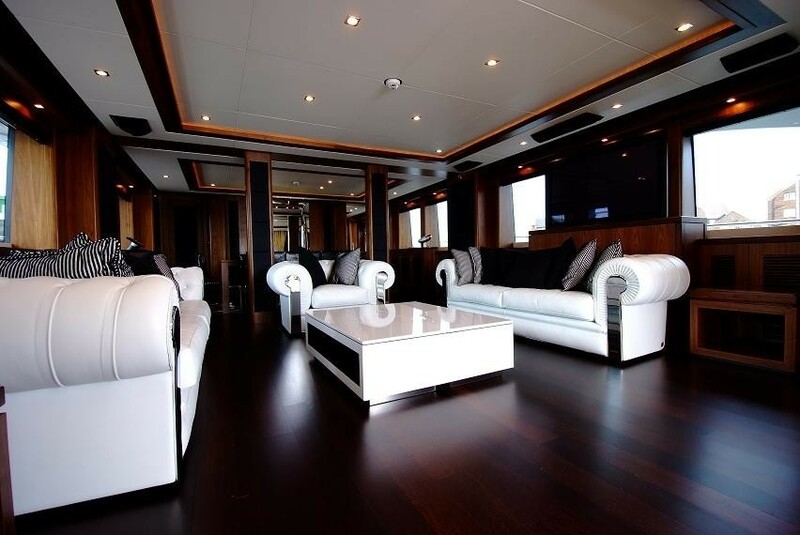 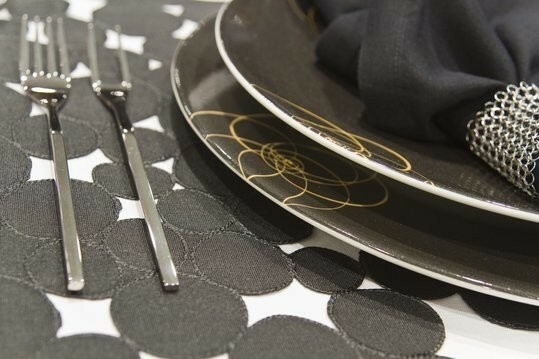 Every detail has been carefully thought out to give the highest standard finish. 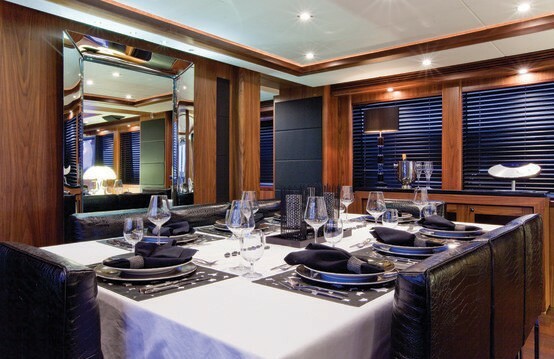 BLACK AND WHITE’s main salon boasts Fendi leather furniture, Philip Starck mirror, and American Walnut carpentry, not to mention the latest Bang and Olufsen media system. 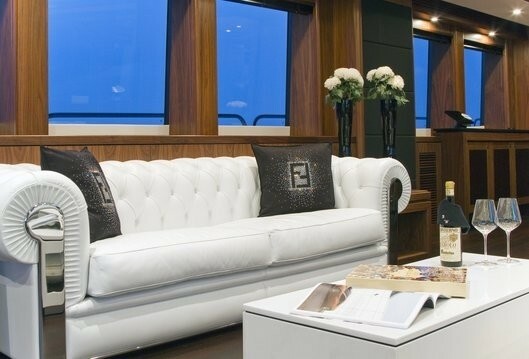 She is stylish and minimalistic with all the furnishings upholstered in either Black or White. 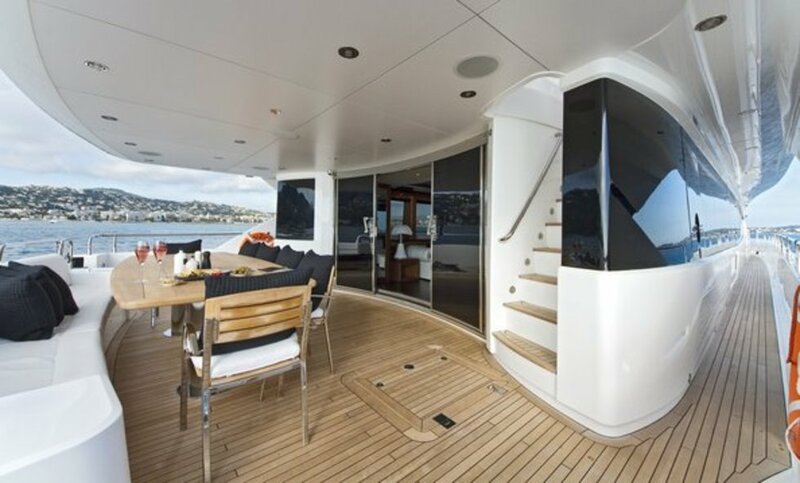 The yachts large windows provide plenty of natural light and great views beyond. 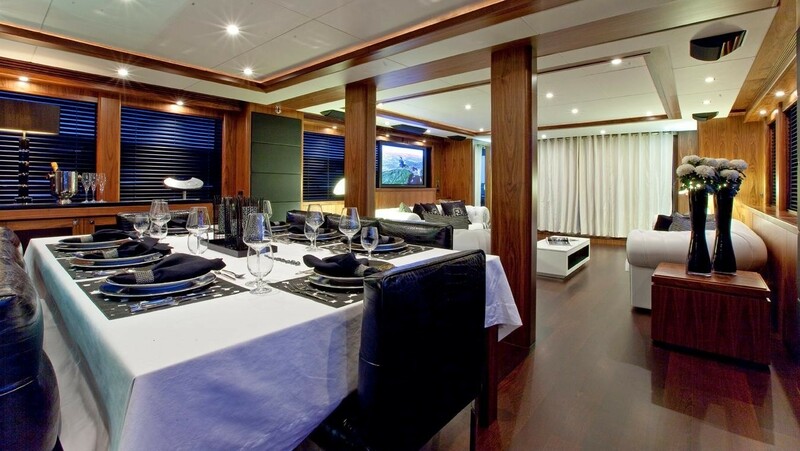 Further forward is the formal dining area fitted with black leather chairs and an exquisite table. 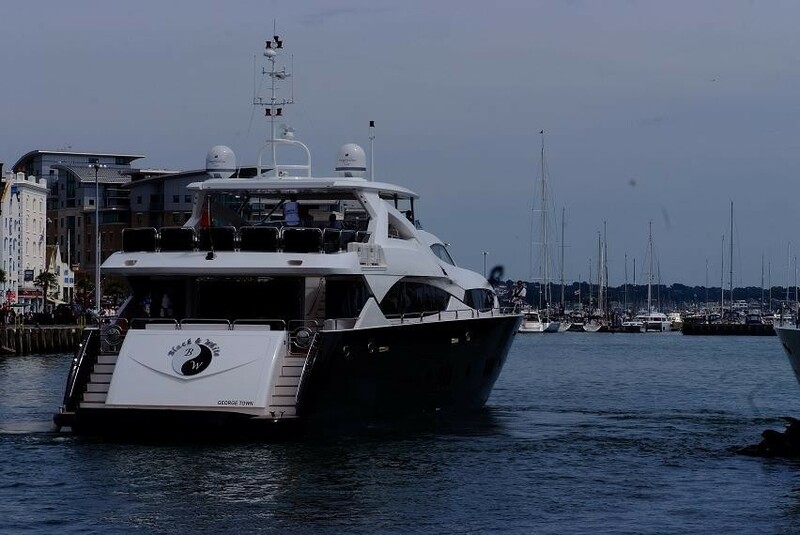 There are fantastic outdoor spaces including a large aft deck with an al fresco dining table, access to the main salon via large glass door and access to the top deck via stairs on the starboard side. 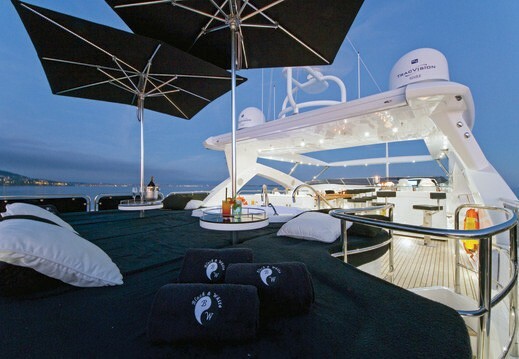 The spacious sundeck has plenty of sunbathing areas aft, with a good sized Spa Pool and optional parasols or canopy cover. 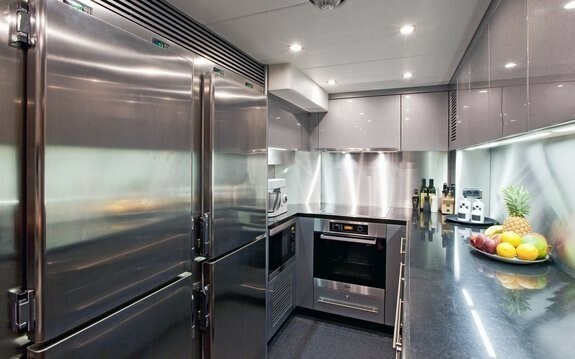 There's a tropical misting system to help keep guests cool. 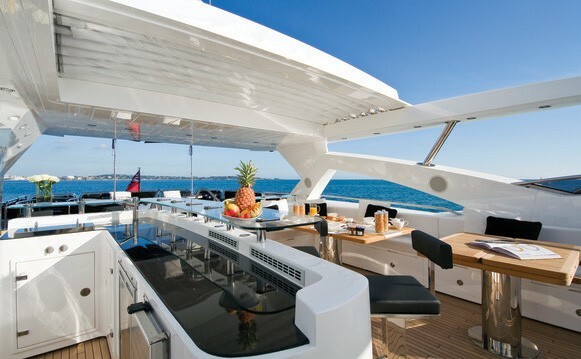 The large bar area comfortably seats six guests on revolving chairs, and there's an alfresco dining area for up to twelve guests. 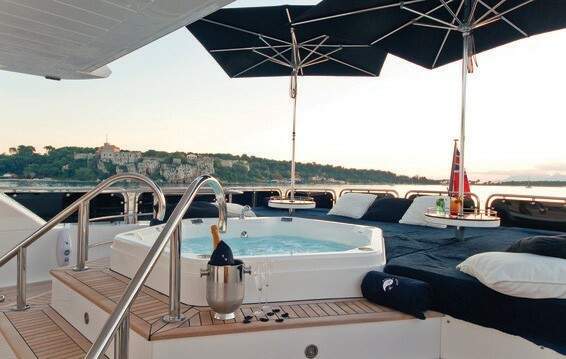 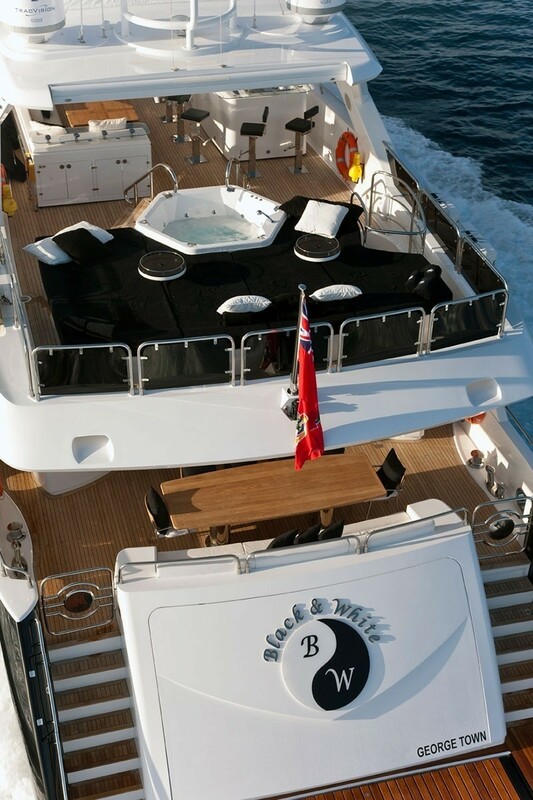 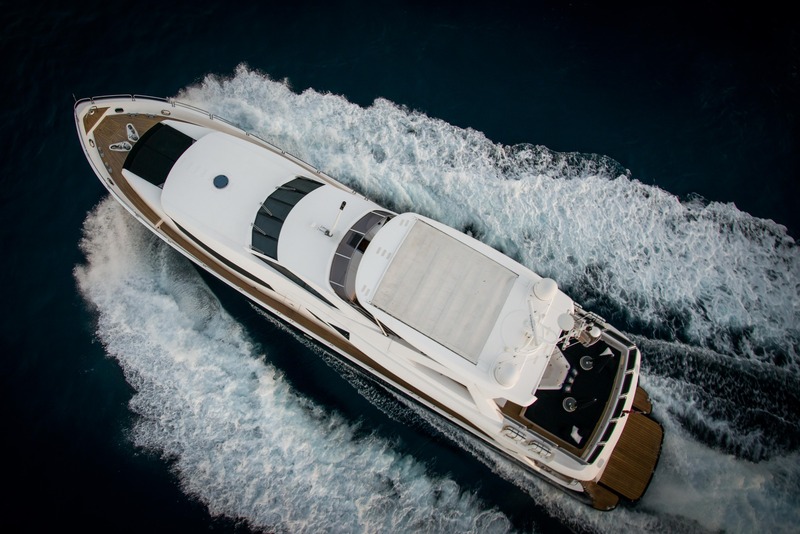 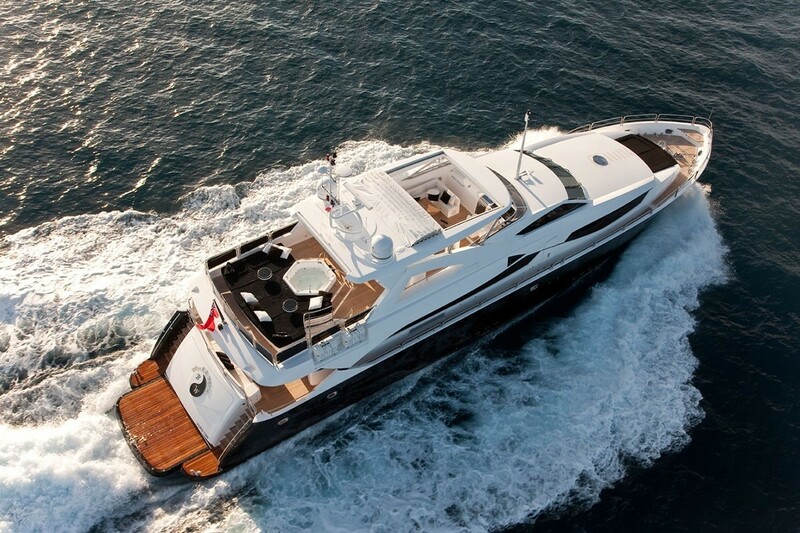 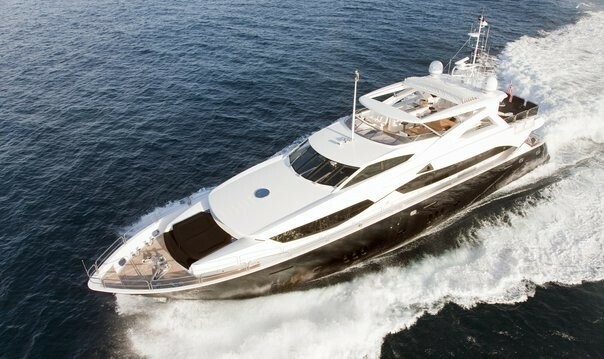 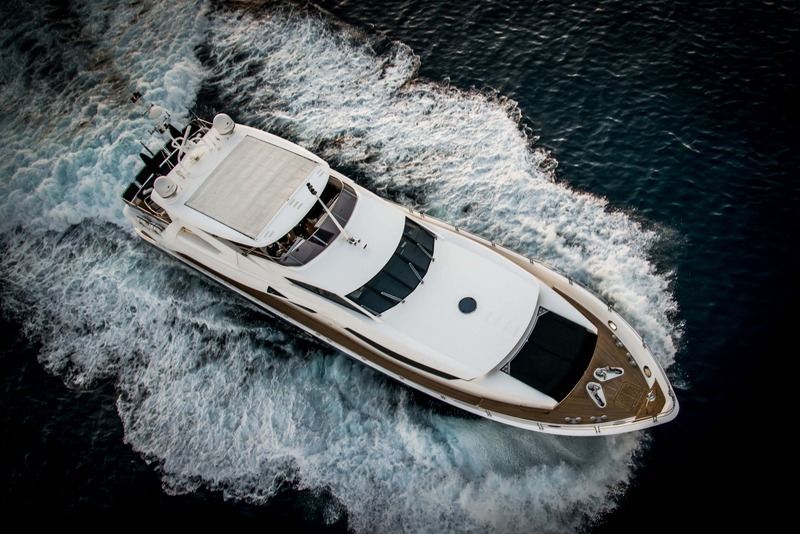 Motor yacht BLACK AND WHITE has a professional crew of 5 onboard. 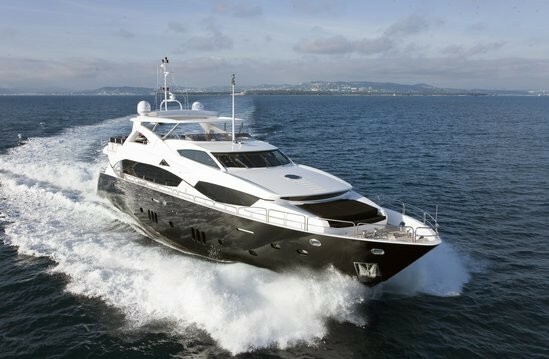 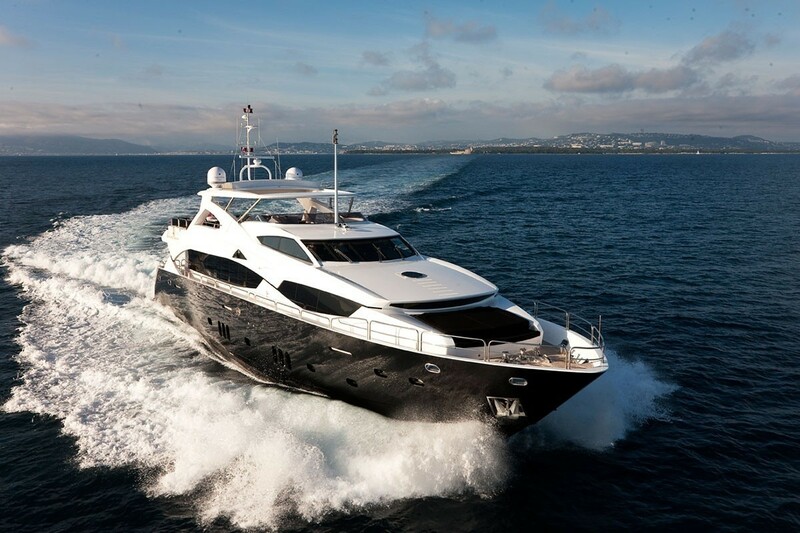 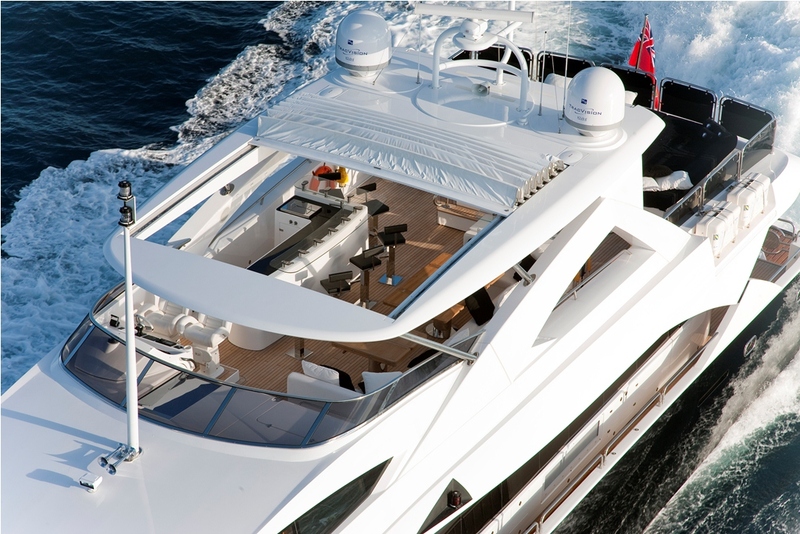 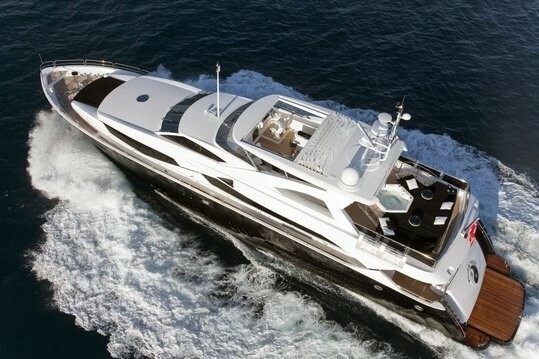 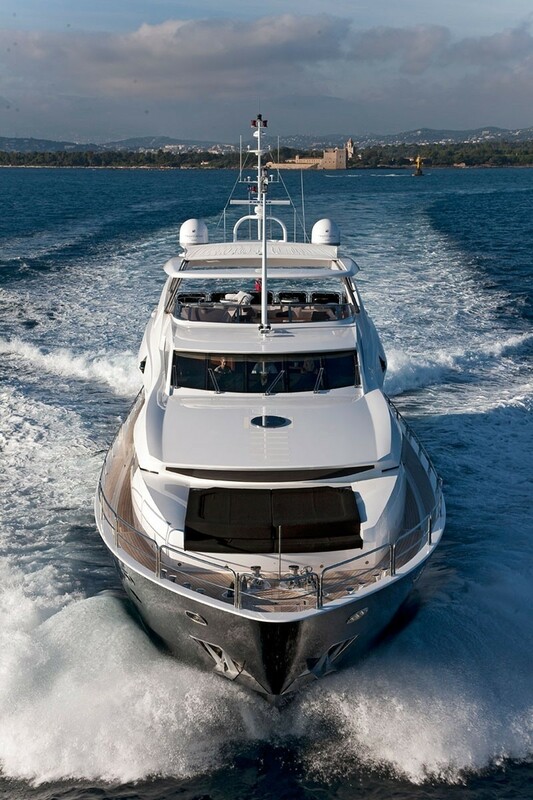 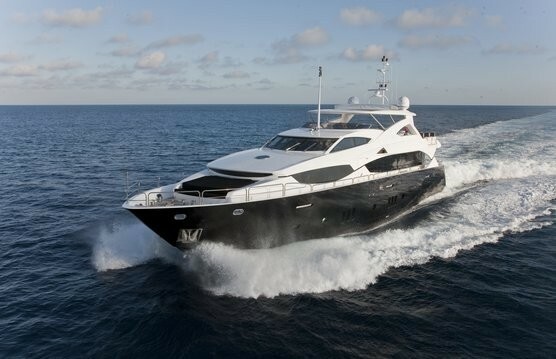 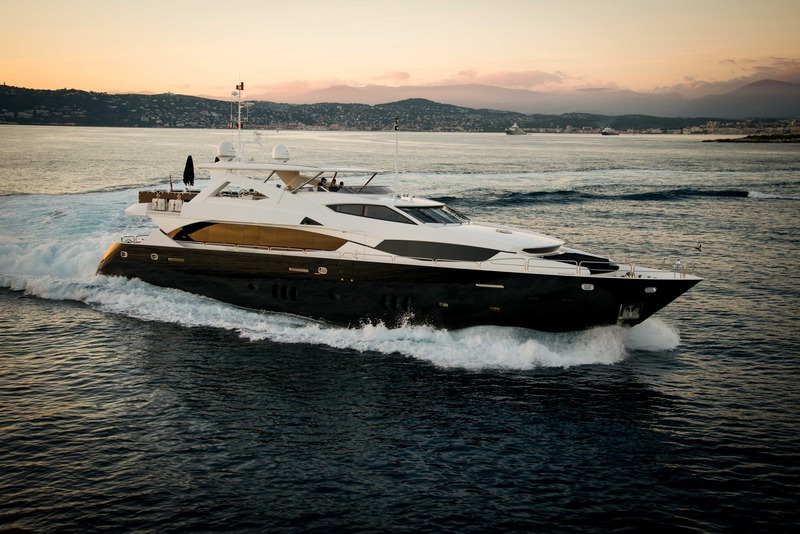 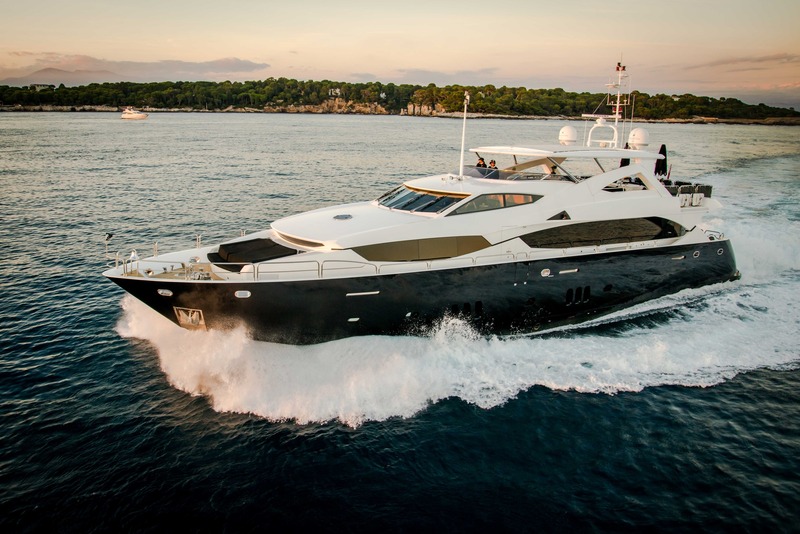 The 2010 Sunseeker BLACK AND WHITE can accommodate up to 10 guests in 5 cabins. 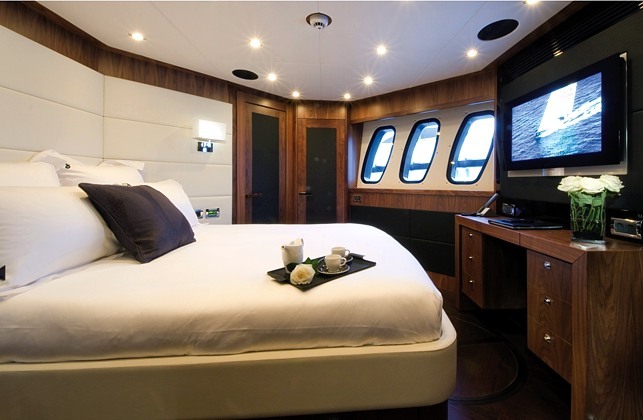 The luxurious Master cabin features a King size bed with a window view forward so the guests can see the horizon from their bed. 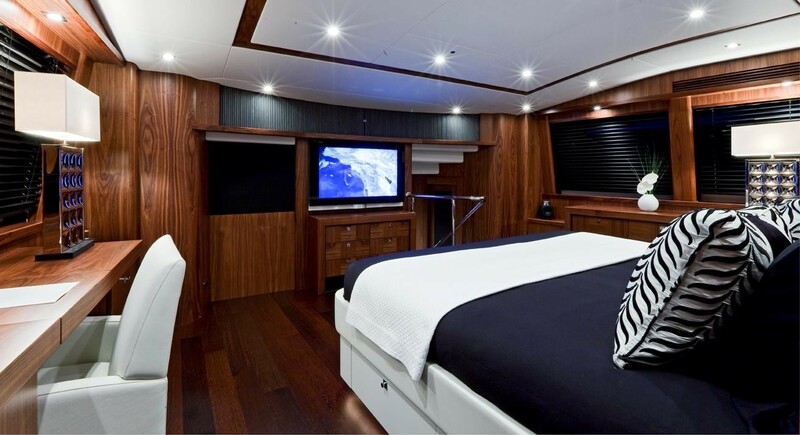 The master cabin has a full walk-in wardrobe with plenty of space for storage. 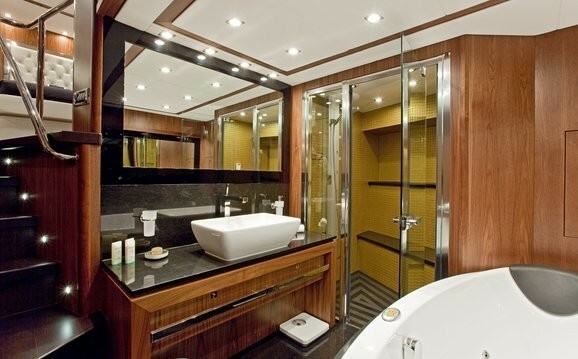 The master ensuite has a separate toilet, a large spa pool bath, and a magnificent gold tiled mosaic shower. 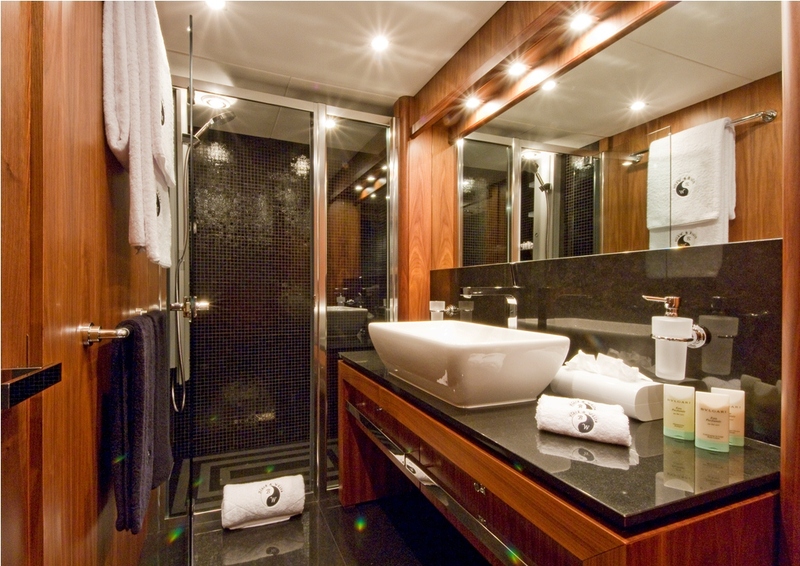 There are identical spacious two VIP cabins, with ensuite bathrooms and beautiful black tiles mosaic showers. 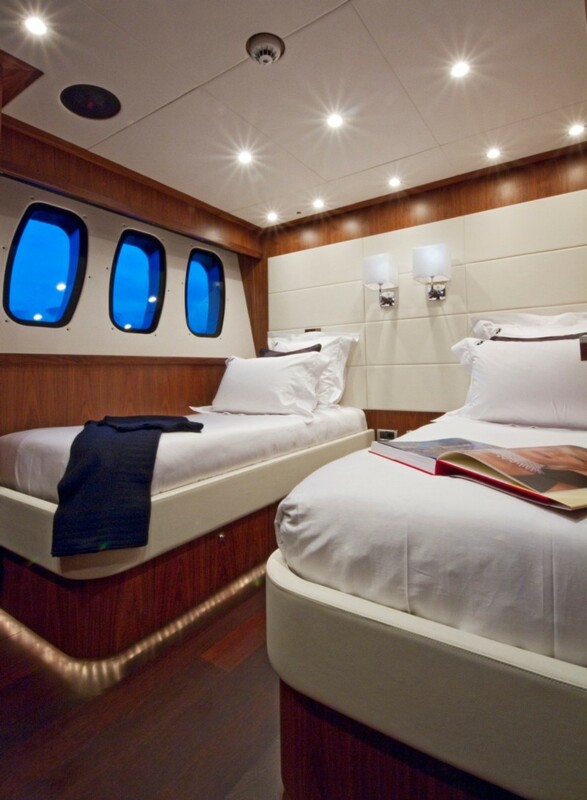 There are also two similar twin cabins with very good sized single beds and an ensuite. 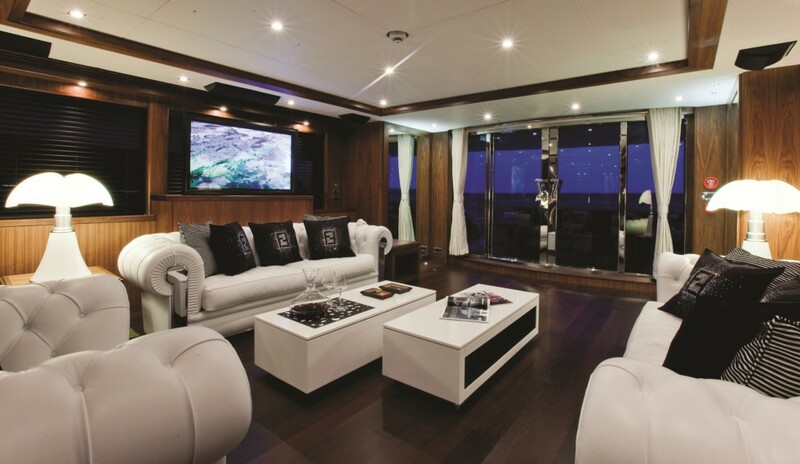 All cabins have a Bang and Olufsen TV system, and there is a lobby area for the guests. 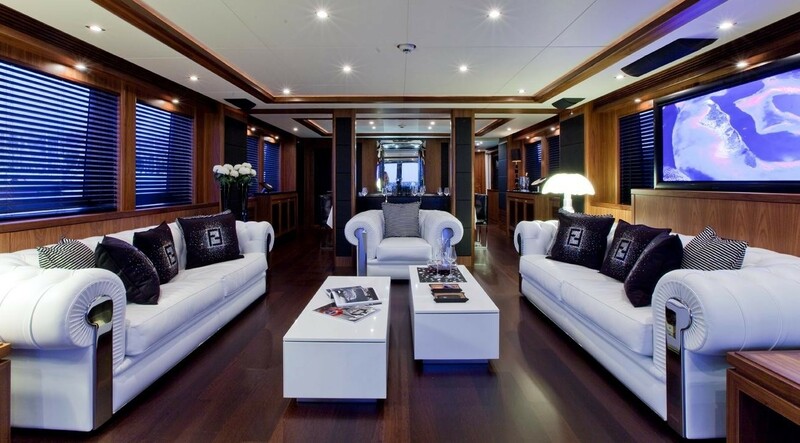 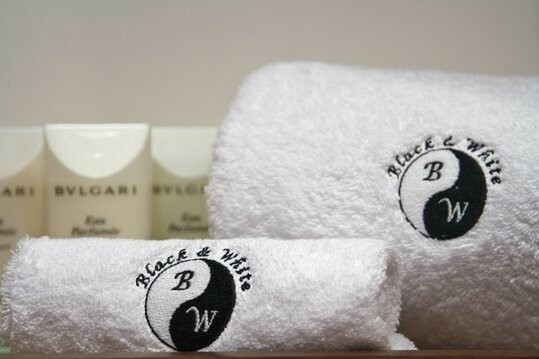 As with the communal areas of the yacht, the theme of Black and White transpires through the whole accommodation area. 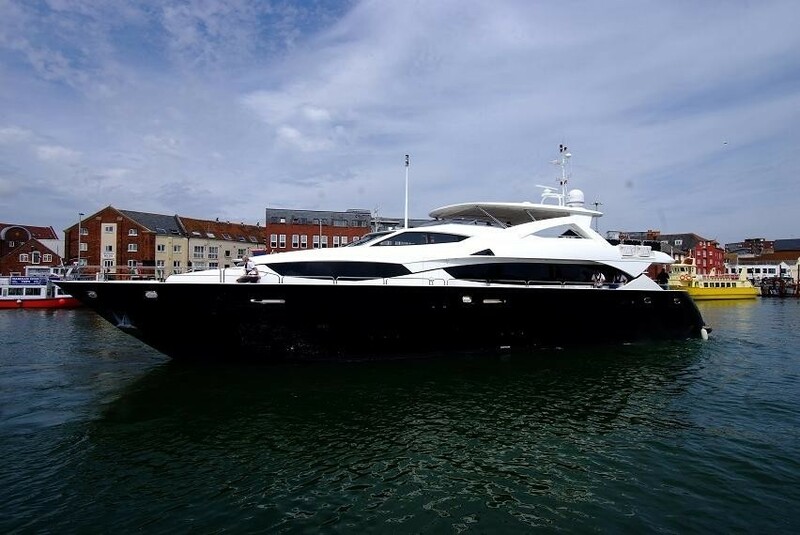 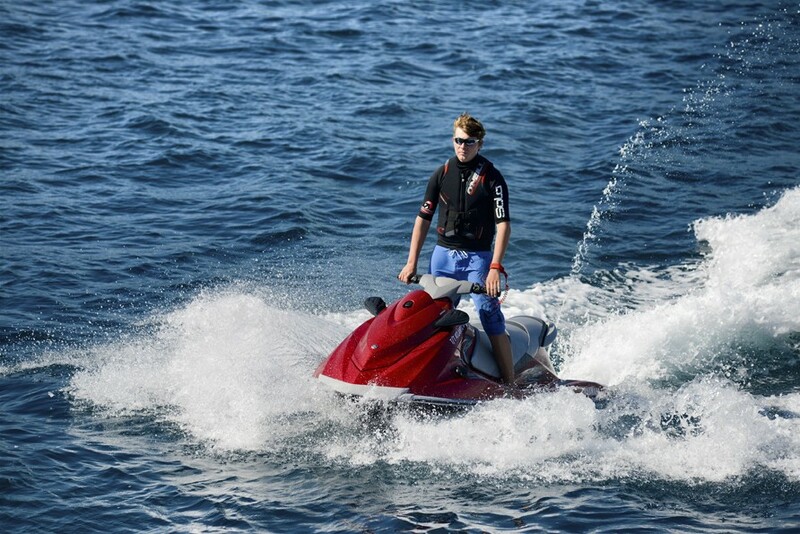 Luxury motor yacht BLACK AND WHITE has the following Tenders & Toys: Jet black 6m Castoldi Custom Tender 2 x Wave Runner Wakeboard Waterskis Inflatable toys Snorkelling gear Basic fishing gear Audio Visual Equipment and Deck Facilities: Bang and Olufsen throughout. 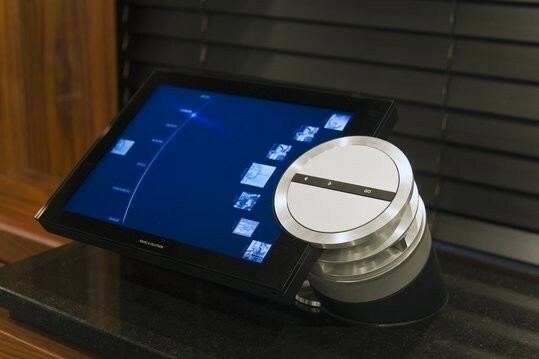 Ipod docking stations in all cabins. 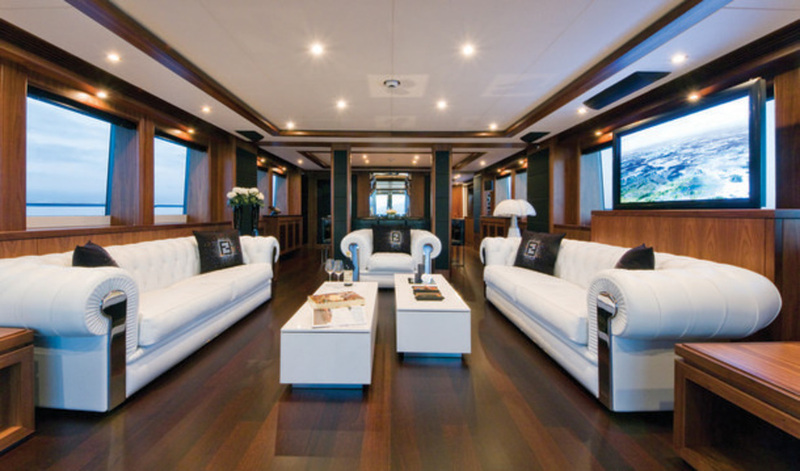 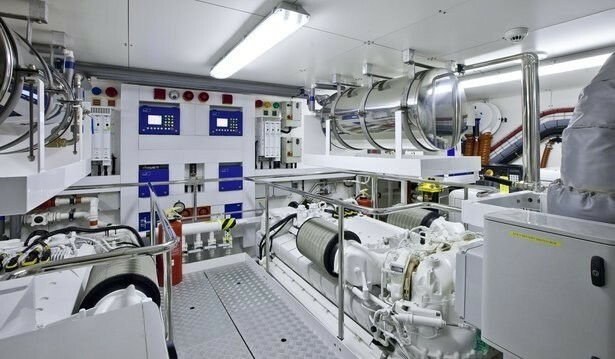 Communications: French TNT channels only in cabins lower deck. 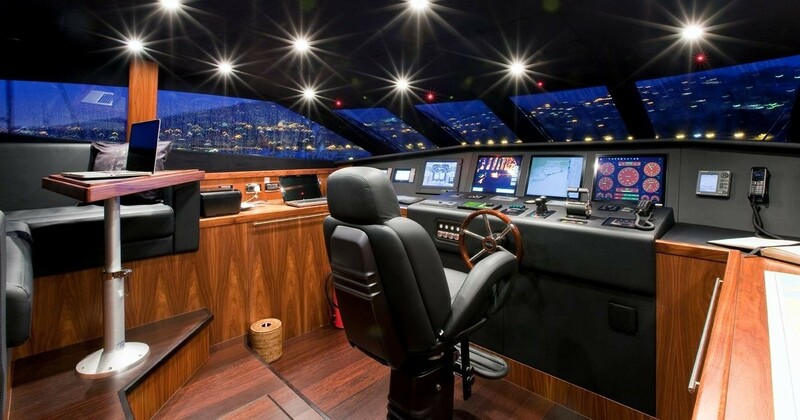 Canal Satelite in Master Cabin.